It goes without saying that Detective Comics #1000 is a major event book. After all, it isn’t every week that a comic series reaches its one-thousandth issue. Of course it’s only natural that DC Comics should mark this occasion with a deluxe-size book with dozens of variant covers by some of the most popular artists to ever handle The Dark Knight Detective over the past eight decades. Little of this concerns me, however, as a critic. Historically, yes, the 1000th issue of a comic is an important milestone, but all this tells us nothing of content of the book. So is there anything to the actual stories inside of this comic? Thankfully, yes. Just as the covers of Detective Comics #1000 pay tribute to the many artistic interpretations of The Caped Crusader, so too do the stories offer a number of creators their chance to tell an untold tale of Batman. As with last year’s Action Comics #1000, I’m reluctant to run through the full long list of creators involved with this book. And as with that earlier milestone book, there is a little something for everyone in this volume. 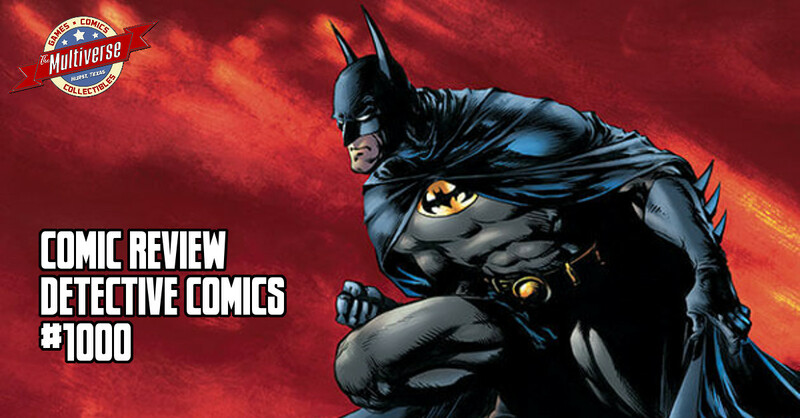 Supposing you’re a fan of the modern Batman books? We have a story by Scott Snyder with art by Greg Capullo, a Tom King story with art by Tony S. Daniel and Joelle Jones and a James Tynion IV story with art by Alvaro Martinez-Bueno – his partner on his recent Detective Comics run. How do you feel about old-school, classic Batman? We have a story written by Denny O’Neil and a different story with art by Neal Adams. No idea why they weren’t teamed together, but they’re partnered with artist Steve Epting and writer Christopher Priest, respectively, to brilliant effect. Want to know what the future holds rather than the past? There’s flash-forward stories showing potential futures for Batman by Geoff Johns and Kelley Jones and Brian Michael Bendis and Alex Maleev. And the whole thing ends with a preview of the next big storyline, which will introduce the Arkham Knight into the reality of the DC Comics Universe. In the end, I think the stories you like best will probably depend on which version of Batman you grew up with. That seems to be the case for me, as I grew up with Batman: The Animated Series and my favorite story was Paul Dini’s contribution – a comedic short story where Batman’s villains recall their encounters with the most incompetent henchman in Gotham City. But I also had a soft spot for the story by Kevin Smith and Jim Lee which details Matches Malone’s journey into an underground market for criminal collectibles. Secret Stash. indeed! Detective Comics #1000 releases on March 27, 2019!